Year 2017 : This year, the 10 days Mela (Fair) dedicated to 6 decades old Sufi Saint Makhdoom Mahimi will begin on 3rd of December and last till 12th December 2017. As always, the first offering of Sandal to Dargah is from Mumbai police and the fun and fair will will have lots of fun games, giant wheels, lots of non vegetarian food (Mutton, Kheema, Kabab and Koftas with and special falooda) and lots more in this yearly dargah fair event. Year 2015 : This year on 25th December 2015, the 10 days long fair started and like every year since pass so many years / decades, Mahim Police were the first to offer first salute (Salaam) in the form of offerings and Sandal Paste and Chaddar on baba’s dargah. With that starts Fun Fair that has various rides, food stalls, stunts, games along the sea side of Mahim beach. Starts on 20th December every year since 1920, Hazrat Makhdoom Fakih Ali Mahimi Trust who manages this spiritual Dargah, organizes fun and fair events during these 12 days of festive celebrations with things like Dance, Lecture, Qawwalis and more. Since year 2011 and from 2012 they have started preaching strict Islamic law and have stopped playing movie songs and non traditional dance performances. Trust and managing committee member believes in following Anti-Sharia (Islamic laws) during all the festival dates at this Dargah. Anti Sharia means activities not allowed according to Islamic laws and some of them are loud Hindi film music, dance performances etc. Instead they will perform Nath Shariat (poems in praise of the prophet) at pakh Mahimi Dargah. Also as Sufism allows Qawwalis (A Special Singing Concert and Musical Folk), it can be performed during festival. Sufi Music and Qawwalis will be performed by special Qawwals coming from other known states like Hyderabad and Bangalore cities. These Qawwali program is heartily arranged by Mumbai police at its Mahim police station. 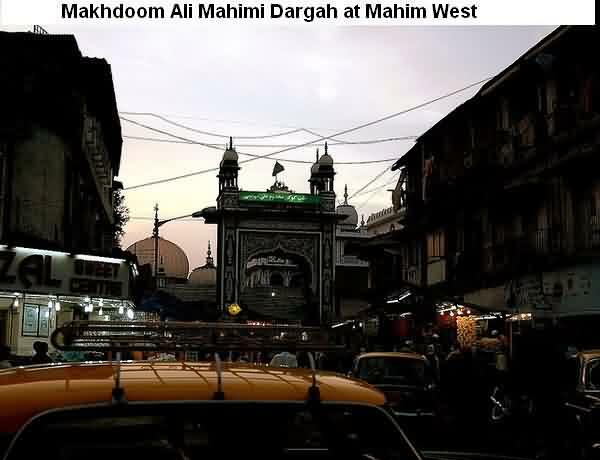 Makhdoom Ali Mahimi baba was also Patron and famous saint between police of Mumbai since so many years. Mumbai police are also among very few who offers first ‘chadar’ and ‘sandal’ (sandal is made up of incense sticks and scented stuff, and other paste made up of sandal wood) to baba at this dargah every year. Yearly, this festive attracts Lakhs of devotees from Mumbai and also from other states of India. Tourist who visits Mumbai around this dates of December can take the pride to attend the festival and have a look at the celebrations and also gather some knowledge and understanding of Islamic events and festivals in Mumbai. About 5 to 7 Lakhs visitor devotees attended these 12 days events every year. Also Fun and Fair is the integral part of this celebration event. Hundreds of Food and eatery stalls, Other toys shops, Balloons and eateries are seen. Mahimi trust also keeps ‘Langar’ which is offering free food to all who attends Baba’s dargah. This is something which is considered good cause to Humanity and ‘Mahim Dargah Trust’ does this every year. More about Mahimi baba here. Address to Reach Mahim Dargah : HMA Fakir Street, Off Swatantrya Veer Savarkar Marg, Mahim West, Land Mark – Near Mahim Shrine, Mumbai – 400016.